The area’s football fans have gone six months without watching their favorite team in action, and training camp still hasn’t arrived yet. There must be some way to talk football as the new season approaches. And there is. The Professional Football Researchers Association is coming to town. The PFRA’s bi-annual convention is set for this weekend, July 13-15. It will be held at the Buffalo History Museum, at One Museum Court in North Buffalo. Greg Tranter was perfectly positioned to make this event happen. Not only is he the biggest collector of Buffalo Bills’ memorabilia – he donated his vast collection to the History Museum – but he’s also the President of the Museum’s Executive Committee. “Actually, I’m a member of the organization,” Tranter said. “They had the convention two years ago in Green Bay. I attended because I wanted to see if I could raise some interest in Buffalo as a host city. Buffalo had been suggested as a location for it before, but it didn’t get a lot of interest. But there was growing momentum for Buffalo as a host city. I told them about the ‘Icons’ exhibit at the history, and that I had donated my collection. George Bozeka, the vice president of PFRA, came to Buffalo a little more than a year ago. He went home to Akron, Ohio, convinced that the city would be a good fit with the other hosting cities in the past – such as Green Bay, Cleveland, and Canton. The group also met at the office of NFL Films outside of Philadelphia one time. A good portion of the membership lives in the Midwest and Northeast, so Buffalo fits in well. Few cities knocked on the door of professional football more than Buffalo did. Western New York was home to an NFL team in the 1920s, starting with the All-Americans in 1920. It had the league’s best record in 1921 with a 10-1-2 record, but the NFL ruled that one of the team’s games was against inferior competition (schedules were not too structured back then) and didn’t count in the standings. Therefore, the Chicago Staleys were handed the title in a move that can still anger fans partial to Buffalo football to this day. The team changed names in the 1920s a few times, and disbanded in 1929. There’s an odd footnote to Western New York’s NFL connection in the 1920s. The Tonawanda Kardex played one game in the NFL. Membership in the league was rather flexible back then, and the Kardex played a game against the Rochester Jeffersons in 1921. Tonawanda lost, 45-0, and promptly disbanded. Buffalo tried its luck in 1941 with the original American Football League in 1940, a group that was legally formed at the Hotel Lafayette on Washington St. in Buffalo. But World War II took care of that circuit. After the war, Buffalo joined the new All-American Football Conference in 1946, and lasted through 1949. The Bisons – and later Bills – were popular and made it to the championship game in 1948, losing to Cleveland. The AAFC merged with the NFL for the 1950 season, but the Bills were left out of the new lineup despite drawing relatively big crowds to War Memorial Stadium. Buffalo hosted some NFL games in the 1950s. Football teams often had to wait for their baseball counterparts to finish their seasons before taking over the field. Therefore, football’s New York Giants and Chicago Cardinals stuck to road games early in the season until the Yankees and White Sox finished play. Buffalo was considered a likely spot for an NFL expansion team by the late 1950s according to Commissioner Bert Bell. But then another new league, also called the American Football League, was about to be formed. Ralph Wilson almost put a team in Miami, but chose to place it in Buffalo. 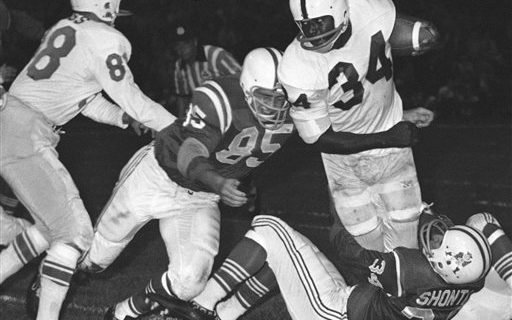 The Bills were reborn in 1960, and finally joined the NFL through the 1966 merger. There will be plenty of football items for the visitors – numbering more than 50 a few days before the start – to ponder during their stay in Buffalo. It starts on Friday with a tour of the Buffalo History Museum Resource Center on Forest Ave. Then the sessions move to the History Museum. It opens with three familiar speakers – Booker Edgerson, Eddie Abramoski and Ed Rutkowski. All three will join journalist Tim Graham for a panel discussion. Later in the night, PFRA member Brian Marshall will talk about the legendary Cookie Gilchrist. Marshall will concentrate on Gilchrist’s time before arriving in Buffalo; Gilchrist turned pro right out of high school, but had to play in the CFL before the American teams would sign him. Then Joe Ziemba will follow with a discussion of the relationship between the Chicago Cardinals and Buffalo. On Saturday, proceedings open in the morning with some introductions and business discussions. Then the highlight of the weekend for some arrives – an appearance by Thurman Thomas. “It’s really nice to have him there,” Tranter said. “When we were in Green Bay, the two players who came were Zeke Bradkowski and Bob Long. They were well-known players but not Hall of Famers. Ex-Bill Joe Bock and retired Bills’ executive Denny Lynch will be speaking about their football experiences from there. After a tour of the History Museum and the showing of a documentary about Ralph Wilson, members will gather for the PFRA Quiz Bowl. It will be very tough to stump that crew. The schedule closes in style on Sunday morning with a tour of New Era Field. The members certainly will celebrate the release of their second book, a collective effort involving several different individuals. The PFRA has been around since 1979, so this is its 40th year. It has 371 members in seven countries, and about 50 of them are planning to be in attendance. As you might have guessed, interest in old-time football tends to lean toward the male gender. The cost to attend the weekend’s events is $40 for members and their spouses, and $90 for non-members. But for those who are interested but don’t want to pay full price, Bozeka has a money-saving idea. Members receive six issues per year of the PFRA’s research magazine, “The Coffin Corner.” The latest issue contains stories on such subjects as Walter Payton’s 1977 season, and an all-half-decade team for pro football from 1915 to 1919.